Kansas is known more for its ravaging twisters and wheat fields than it is for its thriving gambling and real money poker scene, so most outsiders are surprised to learn that KS boasts a relatively healthy poker scene. Unique to the Sunflower State is that the state’s land-based casinos and real money poker gambling rooms are operated by the lottery. And as we’ll soon see, one Kansas City casino in particular has been taking the Midwest gambling scene by storm. Yes, “there’s no place like home” for Kansas’ real cash offline and Internet poker gamblers. Yet, despite its pro-gambling and poker betting stance, Kansas’ state officials have not yet warmed up to the idea of online gambling and Internet poker websites – quite the contrary. In fact, Kansas has gone so far as to propose criminalizing online gambling at real cash poker websites if it would help facilitate the growth of its brick and mortar casino and poker gambling industry. This has led us to believe that it won’t be passing an iGaming legal Internet poker act anytime soon. That just means KS residents might have to wait a little longer for their legit Texas Hold’em poker games than gambling fans in other states. Skip out on the intense heat or stormy weather. Take a seat on the virtual green. Signing up at a real money US poker site is a breeze for those of you in The Sunflower State. 2 Can players from Kansas play online poker? 3 Is online poker legal in Kansas? In April 2013, a gambling and poker betting expansion bill that would drastically reduce the cost of building a casino or real money poker room in a sparsely populated region of Kansas failed by a 24-15 vote . An amendment calling for the criminalization of online gambling in the Sunflower State was included as part of the poker and casino gambling bill (Senate Bill 2055). If passed, the SB 2055 would have also banned electronic slots and other e-Games like real money video poker from pari-mutuel facilities until 2032. The amendment to the gambling and betting bill was proposed by Kansas State Senator Jacob LaTurner, and would classify Internet poker gambling as a class B nonperson misdemeanor. Guilty parties would also be required to pay fines up to $1,000 and spend as much as six months behind bars for betting real money on poker websites. The new statues would encompass both real money Internet poker players and poker website operators. After passing a general vote on Internet poker and lawful gambling websites in the Senate via a 26-11 margin, several of the KS state’s Senators had a change of heart, reflected in the final tally. To date, legislation calling for an online gambling ban making Internet poker illegal has not been reintroduced by the Senate. In other news, 2013 proved to be an active year for Kansas City’s casino and real cash poker market . In particular, the Hollywood Casino at Kansas Speedway , which resides on the Kansas side of Kansas City, increased its market share from 15 to nearly 18 percent. Kansas City, Missouri casinos and real money poker rooms did not fare as well, losing nearly $100 million in annual adjusted gambling revenue from 2011 to 2013. Comparatively, the Hollywood Casino increased its year-over-year real cash betting revenue by over $130 million. Can players from Kansas play online poker? Kansas residents who are partial to a bit of Internet poker real money gambling will face no hurdles when signing up for one of our US real money poker websites. That’s good news, especially when you consider that Kansas’ volatile weather sometimes makes traveling to local casinos for a game of Texas Hold’em poker a real chore. All of our preferred US-facing real cash poker websites do a more than admirable job of providing players with an online Internet poker gaming experience that mimics the one found in live poker rooms across KS and beyond. If anything, the real money poker action is faster, the poker betting stakes more varied and the players, well…fishier and easier to turn into prey. Although an attempt was made to outlaw online gambling and real money Internet poker in Kansas, it failed to achieve the necessary votes required to pass into law. Now before you start celebrating, that doesn’t exactly mean that online poker websites are legal – just that Internet poker resides in a murky gray area, unaddressed by the KS state’s gambling and betting statues. Overall, the state’s real cash gambling and betting laws are fairly strict, although nowhere near as rigid as those found in some neighboring states – Missouri for example. Notice the usage of the phrase dependent upon chance. One could make an argument that the outcome of a real money poker game is not wholly reliant on chance, but that real cash poker betting revolves around skill too and therefore offline and Internet poker is exempt from the law. However, in the more likely scenario, the KS state classifies all gambling games, including real cash poker, according to the Dominant Factor Test. According to this test, if chance is the dominant factor in determining an outcome, then real-money wagers on that outcome would be considered bets. Gambling and betting is classified as a class B nonperson misdemeanor. Those who possess real money poker or casino gambling devices or permit premises to be used for commercial gambling or poker betting are subject to similar charges. Illegal bingo operators can be slapped with a harsher penalty in KS – a class A nonperson misdemeanor. Social gambling and social real money poker betting is not specifically addressed, although the law does distinguish between those hosting a casual home game and those operating an illicit real cash poker gambling arena. That said, as long as you don’t charge players to play in Kansas, you’ll be less likely to face the same harsh penalties as unlicensed commercial real money poker and gambling operators. 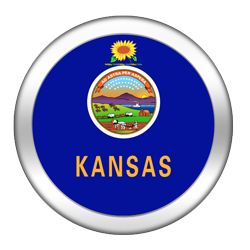 If you’d like to review Kansas’ poker betting and real cash betting state code  in more detail, please refer to the “References” section. Kansas’ colorful gambling history dates back to the early days of the Old West. In the frontier days, lawlessness and corruption ruled the land, with several of Kansas’ cities becoming famous for their debauchery and real money poker scene. Of note, Dodge City evolved into an archetypical Old West town, chock full of not so legal gambling saloons with regular Texas Hold’em games, prostitutes and danger. The first attempt to curb real cash gambling occurred in 1868. It prohibited facilities from using tables or devices for games of chance, but did not include real money poker betting. By 1895, real cash gambling was only permitted at state fairs, and eight years later slot machines were completely banned in Kansas. Despite this, underground gambling and poker betting rings ran rampant, so much so, that law enforcement agents all but gave up on curtailing the non lawful real money poker and gambling scene entirely. In 1986, Kansas voters approved a constitutional amendment on real cash gambling permitting a state-owned lottery. That same year, residents also voted in favor of what would ultimately become the Kansas Pari-mutuel Racing Act. The Kansas Racing Commission was created shortly thereafter, and the first greyhound and horse racing real money gambling facilities opened their doors to the betting public by 1990. Unique to Kansas, only non-profit organizations are permitted to operate racetracks with real cash gambling. In 1995, five of the state’s tribes were granted the right to construct and operate casinos and legal poker rooms. The KS state’s first tribal casino would open a few years later, and today several real money poker rooms and gambling casinos pepper Kansas’ landscape. Commercial gambling and real cash poker betting is not permitted in Kansas, at least not in the traditional sense. In 2007 the Kansas Expanded Lottery Act extended the reach of the state lottery dramatically, first allowing for the conversation of racetrack gambling facilities into racinos offering real money gambling and real cash poker. And then in 2010, in what would amount to an unprecedented move, the first lottery run casino in the United Stated opened its doors – in Dodge City of all places . Thanks to the state lottery commission, Kansas is able to offer more forms of gambling than it would otherwise, including a special type that for all intents and purposes resembles regulated commercial gambling and normal real money poker. Pari-mutuel wagering and charitable gambling are also permitted, although the latter is restricted to bingo only. Despite the fact that Kansas is friendly to land-based poker and gambling, there’s no move to legalize online poker in this US state. No news regarding an iGaming Internet poker bill, or even the prospect of one, has made its way into recent headlines, leading us to believe that Kansas will likely not discuss the Internet gambling and real cash poker websites issue anytime soon. Although KS State isn’t opposed to gambling and Internet poker expansion, it appears fixated on the growth of its land-based casino and real money poker gambling operations. So much so, that it would be willing to ban online gambling and Internet poker betting for KS residents if that meant more live gambling facilities would be constructed. Back in 2008, the real money poker playing brothers Blair and Grant Hinkle became the first set of siblings to win WSOP bracelets in the same year. Blair would take down a $2,000 No Limit Texas Hold’em poker event for over half-a-million dollars in real cash poker winnings, but it would be Grant that would win $831,279 after besting an enormous field in a $1,500 NLHE real money poker tournament. Kansas is not the least likely state to legalize Internet poker, but it’s certainly near the bottom when it comes to creating legal poker websites where people can enjoy betting for real money on the Internet in poker games like Texas Hold’em. The KS state’s powerful lottery commission has yet to bring lottery, scratch-offs and bingo gambling purchases online, which means that the infrastructure for online gambling and Internet poker would have to be built from scratch, if a virtual legal poker website structure is ever built at all. That would be fine if real money Internet poker legislators seemed to have any interest in opening iGaming poker website discussions, but to date, they do not. Compounding matters, despite its vast size Kansas’ population of nearly 2.9 million is only one-third the size of New Jersey’s, and would therefore have trouble maintaining a viable intrastate gambling operation and a big enough real cash Internet poker player pool. Even if Kansas did eventually address the issue of real money Internet poker gambling on lawful poker websites, we can’t imagine it would enter the Internet poker industry without an interstate poker website compact in the works.